Paint your home in light. A full RGBW LED strip with Cool Whites and Warm Light. 5m Strip fits nearly any application. A strip of ambient light. The light that fills our homes needs to be both functional and beautiful. LED Strip offers both in one simple to install package. Offering dedicated shades of white light, LED Strip has been engineered to replicate both daylight and warm light. LED Strip is about more than just colours; it’s about the perfect shades of white that we live our lives by. No longer do you have to paint your room in a single colour. LED Strip’s 2 perfect shades of white light are complemented by 16 million different colours of high quality light. Select them. Light them. Let them fill a room or a corner. Paint your home in a light that suits the mood, and then change it all whenever the vibe changes. A strip of useful light. Paint your room with 16 million shades of light. Or fill it with the perfect shade of white. Z-Wave is designed for more than a connected home. It’s designed to create the perfect home. LED Strip lets you decorate with light, and it lets you fill a room with light. 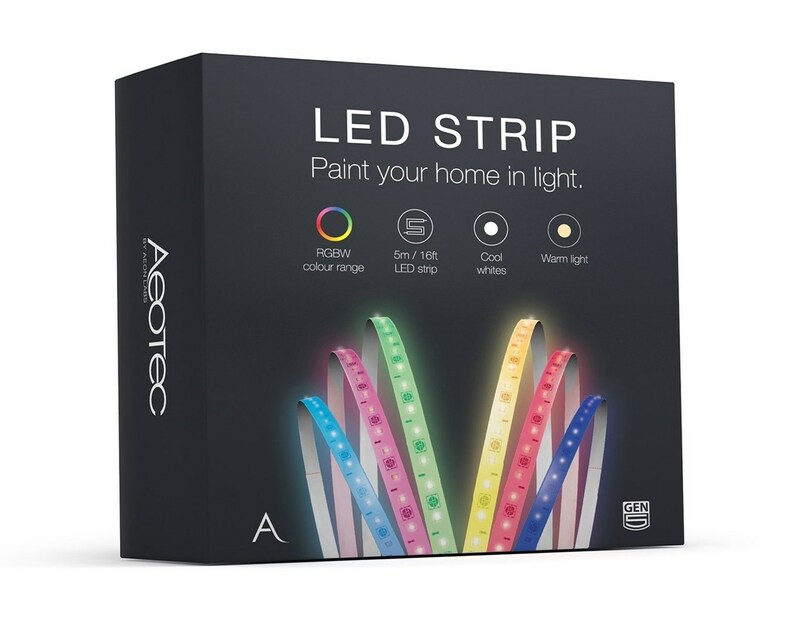 A strip of high-quality LEDs, LED Strip is built upon the lighting expertise and technology that built Aeotec’s LED Bulbs. Powered by Z-Wave, LED Stripallows your home to be selectively bathed in any one of the 16 million light colours that it offers.Schedule them, automate them, dim them, responsively control them. LED Strip takes Z-Wave lighting beyond the lightbulb.